When marketing our flat fee listings, we know exposure is essential. For this reason, we allow all real estate related websites and mobile apps to display our listings. We work closely with all the popular real estate websites to ensure our flat fee listings are shown to the proper demographic. 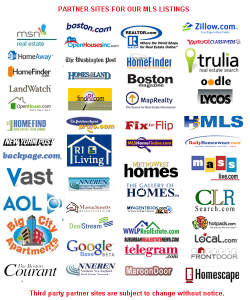 Below you will find a short list of our 3rd party partner sites (Zillow, Trulia, Realtor.com, Boston.com) who display our flat-fee listings online. In addition to partner websites and mobile applications, your flat-fee listing will also be displayed real estate agency websites. If exposure is essential to marketing real estate, remember that perception is as important. This is exactly why we market all listings under our reputable real estate brand name – Hillman Real Estate. Our marketing partner list contains thousands of real estate related websites so it’s not possible to list them all but here are some.